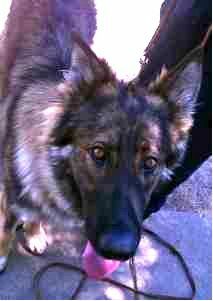 Reese is a gorgeous 1 1/2 year old, plush coat, male German Shepherd. 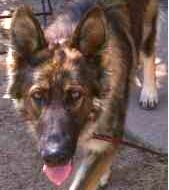 Reese is a very sweet natured boy and for the most part he is a very calm dog for his age. He is a big dog with HUGE paws and is still growing out of the puppy stage so doesn't quite know his own strength. At the moment he doesn't have many manners or training but he will soon! He wants to be with someone and being loved ALL the time. He's a big teddy bear. He likes toys and bones, but is not too fond of the hose. He will make a great family dog! If there are kids in the household, older kids are best as he would probably knock over young ones without knowing it.